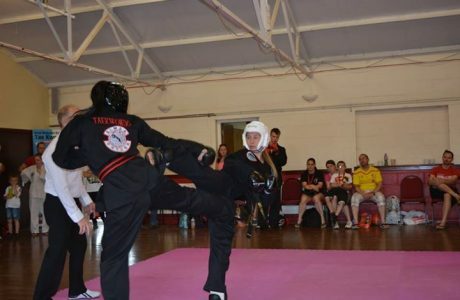 Founded in the early 80’s by a small collective of former TAGB Tae Kwon-Do Instructors and students, the West Midlands Schools of Tae Kwon-Do (WMST) is one of England’s longest established and most successful independent Tae Kwon-Do groups. Since its establishment WMST has gone from strength to strength with well over 250 members training in clubs throughout Gloucestershire practising Tae Kwon-Do. Using the grading syllabus guidelines of Grandmaster Hee Il Cho’s Action International Martial Arts Association (AMIAA) and under the watchful guidance of Master Amrit Kalcutt (7th Dan). As WMST club members, our students are able to train at any of the clubs in the area in the West Midlands Schools of Tae Kwon-Do group making their training easier and more convenient. Clubs meet at Abbeydale, Abbeymead, Cheltenham, Churchdown, Corse & Staunton (formerly Hartpury), Eastcombe, Highnam, Innsworth, Kingsway, Newent, Quedgeley, Ross-on-Wye, Stroud, and Upton & Severn Stoke. All clubs are affiliated members of AIMAA. The West Midlands Schools of Tae Kwon-Do is the home of a dedicated team of Black Belt Instructors who under Master Kalcutt’s guidance provide WMST and its students with a vast array of technical expertise and knowledge. All Instructors are fully certified, experienced, have full professional indemnity insurance, are police DBS checked, and all hold first aid certification, which allows WMST to continually promoting the progression of AIMAA & Tae Kwon-Do, and are committed to ensure that all of it’s members receive the best possible tuition and service. In recent WMST have become one of only a handful of Tae Kwon-Do schools to be a members of the British Tae Kwon-Do Council (BTC), which recognised by the Sports Council as the only Governing body for Tae Kwon-Do in the UK. The BTC, was established in conjunction with the Sports Council to unify and oversee the development of Tae Kwon-Do in the UK. All Black Belt Instructors are fully DBS checked. WMST Interclub Event 2 – Change of Date!! Finding a club is never easy when starting a Martial Art. Now you can find out more about WMST and its clubs to help you find the most suitable one for you. Click on any of the button below to find out more. If you would like further information on any of the WMST clubs, please contact us. Designed to aid students in their training, providing them with the relevant information required for gradings from white belt all the way through to black belt, and help students get the maximum benefit from being a student of Tae Kwon-Do.